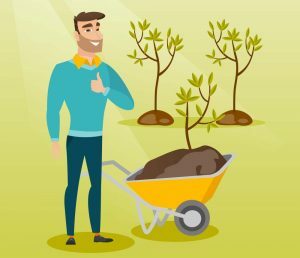 The Proper Way To Plant A Tree…Anytime – Ekana Nursery & Landscaping, Inc.
Spring and fall aren’t the only times you can plant a tree. Trees can be planted any time of the year as long as the ground isn’t frozen. They’re not like flowers or vegetables that have specific growing times, but trees do need to be planted properly if they’re going to grow tall and strong. Odds are the tree you’re planting is contained in some type of plastic container. Find a place for planting, making sure it’s not too close to other trees and it can get plenty of sunlight. Grab a shovel and dig a hole about three times wider than the container. The hole should be sloped on both sides like a bowl, so the roots can grow properly. Knock the sides of the plastic container to help loosen the roots and pull out the tree. Be very careful not to yank or pull the tree too hard as that may separate the roots from the tree. Check the roots once they’re out of the container. If they are bunched up into a ball, they are likely root bound. Take a sharp knife and cut an X into the bottom and four vertical slices down the side. This helps separate the roots lets them grow easier in the ground. Place the tree into the center of the hole. The root collar should be just above the top of the hole. If the tree is too deep, then place soil underneath it until it’s the proper height. Make sure the tree is secure in a straight position and fill in the hole with dirt. Now that the tree is in the ground, you need to prep it for maximum growth. Under no circumstances, use fertilizer or any chemicals on the tree as it can damage and even kill it. Using the sides of the hole, create a basin for water around the tree. Water the tree until the ground is soaked, but not standing water. Place 2-3 inches of mulch around the tree, making sure to not touch the tree trunk. It’s very important that the tree is watered regularly during its first year of growth. You should water it every 7-10 days during dry spells to make sure it’s getting the nutrients it needs. Remove any tags and prune dead branches if need be. Your tree is now secure and ready to grow. Need Expert Advice? We Can Help! Ekana Nursery and Landscaping can help you with all your gardening and landscaping needs. Our experts can answer all your questions and get you started on a beautiful lawn. Call or stop in today!